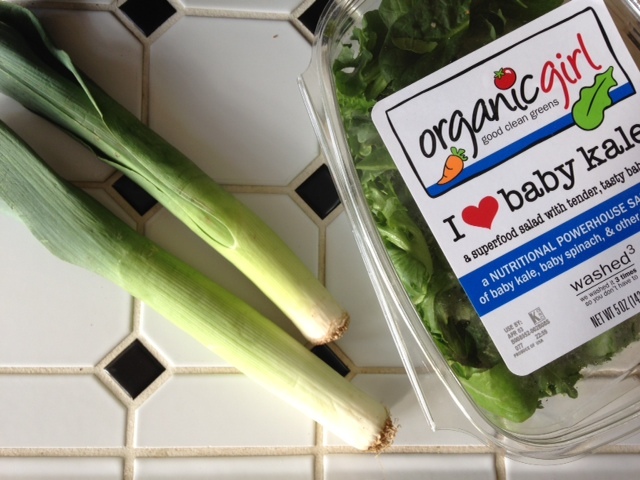 Do you have wilting lettuce and greens in your fridge? Sure you do. We ALL do. I don’t a single hard working home-cook who always gets to the entire content of our vegetable drawers. And THIS is a great way to use them all up. So this is my go-to kitchen sink recipe that I am writing down for my girlfriend Fabiola. She is gung-ho eating vegetarian Monday thru Friday. We’ve joined the troops in mommy-solidarity but also because I have a REALLY FABULOUS dress for my brother’s wedding in mere weeks and have a good 6-8 lbs more to lose before it looks totally amazing. To that end, I am starving poor Dean and cooking every lean, green dish I can think of for dinner. And since I’m not adventurously cooking weeknights, alot of what I am “soup-ing” is greenery on its last legs in our fridge. Usually left over from the weekend. The great thing about THIS little dish is not just the big dose of vitamins, iron and vegetable goodness but that it is foolishly EASY to make and flexible with most veggies wilting away right now in your very fridge! Wilted vegetables at the ready. You DO need some basic staples that you should ALWAYS have on hand like garlic cloves, yellow onions, frozen organic peas, good quality organic chicken stock (low sodium), and left over parmesan reggiano cheese rinds. From these humble ingredients, great things can be born…especially if you have a ham hock from your butcher lying around. And an immersion blender. A MUST. 6-8 cups of Chicken stock, dry white wine, vegetable stock or water. Sometimes its a combination of all 4 depending on what I need to use up. Most leftover vegetables like leeks or shallots, celery and carrots, etc. In a medium pot, heat olive oil over medium-high heat. Sauté chopped garlic and onions for 2-3 minutes until garlic is fragrant. Last night, I halved and sliced 2 wilting leeks. Add your next vegetables here like older celery or carrots and sauté another 2-3 minutes. 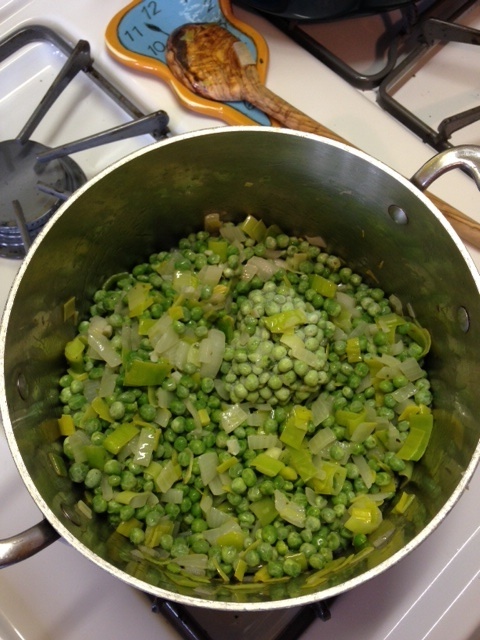 Splash with white wine, water or stock if it looks like veggies are starting to stick to bottom of pot. Pour in one bag of frozen peas. Stir peas and garlic/onion/leeks or shallots or whatever mixture up. Add tiny salt, pepper and pinch of oregano (if you have it.) Add your liquids whatever they are. Last night, I tossed in 1 cup of white wine, 4 cups chicken broth, 2 cups of water and a smidge of leftover vegetable stock from Sunday. I also acquired a small smoked ham hock at the market because for extra flavor and added a small chunk of parmesan cheese rind. Stir well again. Bring to a boil then reduce to a simmer. Simmer soup, stirring occassionally, for 30 minutes. I’ll do laundry or read a few books to the kids. Last night, I pruned 2 rows of Merlot. Yay! 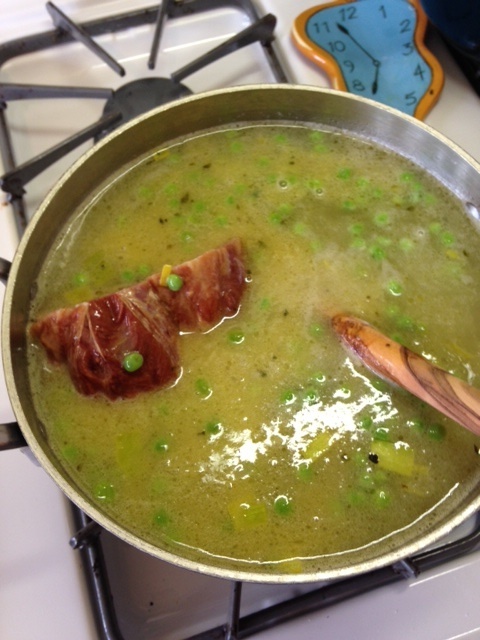 Remove the ham hock or rind (if using) and then literally dump all of your greens, herbs, salad into the pot and stir. 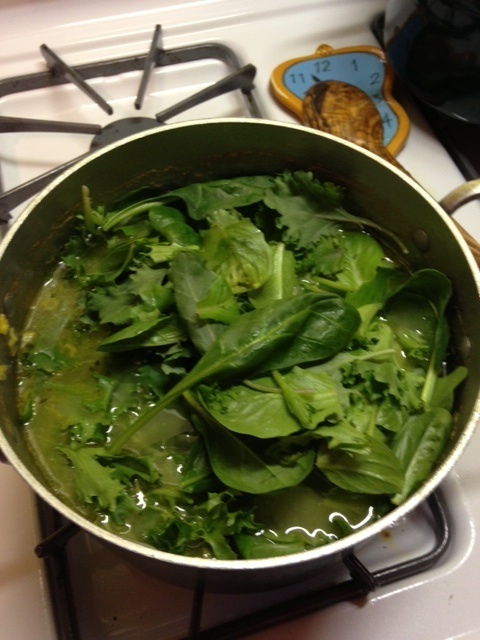 I had left over herbs and baby kale last night. Remove from heat. Then blend the soup — be careful! 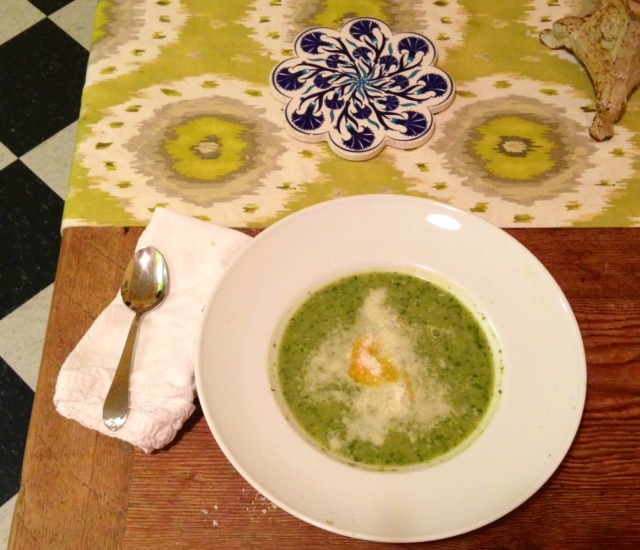 — with an immersion blender until soup runs smooth. Ladle into warmed bowls and garnish with freshly shredded parmesan cheese. I had some left over red peppers and garlic sauce that I had roasted and blended the night before for sandwiches. I spooned that in too. Serve immediately. For roasting peppers and garlic? Slice red, yellow and orange peppers. Take whole garlic STILL in their skins and toss all with light coat of olive oil. Spread on a pan and roast at 400′ for 30 minutes. I then blended them in my little $26 cuisinart. Great for sandwiches and soup garnish. Eggs too. Baby leaves are sprouting. Mustard flowers blooming. Afternoons are warm and sunny. Spring is here! BUT it is still cold in the mornings (40s being cold here in California) and once the sun dips below the horizon, I still like to have something warm on the stove. Or in this case, the Oven. This is the BEST DAMN ROAST CHICKEN RECIPE EVER. And I promised Rob Turner I’d write next on this gorgeous recipe! Thanks to Gail Ross, my foodie friend and intrepid cookbook scout for turning me onto Dorie Greenspan. 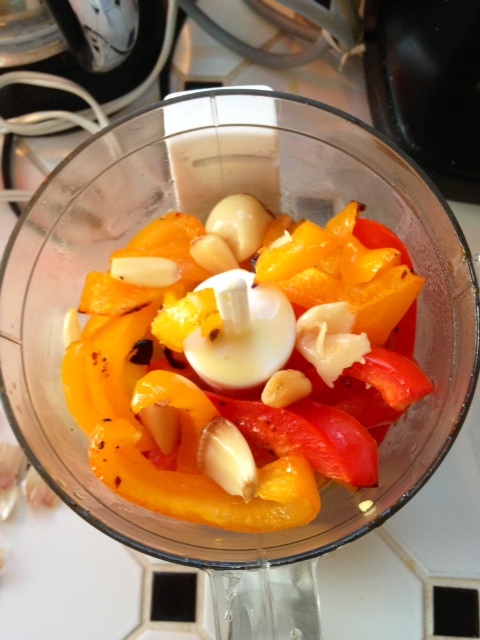 This recipe is a take off on hers…just tweaked. Italian style. 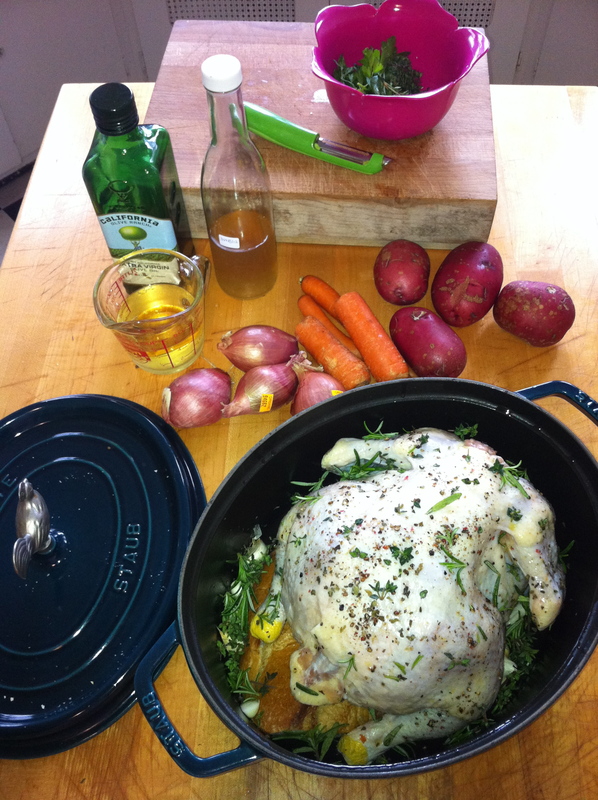 This is the chicken BEFORE I dust with dried herbs. I now make the chicken almost totally covered in herbs for extra flavors. 1-2 even slices of thick country bread. Can be stale or fresh. * Opt for white or plain wheat breads with no heavy herbs or seasoning. Pat dry your chicken. Remove any giblets or bits of feather. Rub a sheen of olive oil all over the interior of a large Dutch Oven. Place the 2 slices of bread in the center of the pot. Place dried chicken on top of them in the center of the pot. Remove excess paper from the garlic clove(s). Chop each one in half so you have 4 half bulbs. Cut the lemon(s) in half. Take a chopping knife and course chop the washed and now dry sprigs of fresh thyme, rosemary needles, and sage leaves. Put all dried herbs in a mortar & pestle to fresh them up. You can also crush them between your hands. INSIDE the cavity of the chicken, place a mixed bunch of fresh herbs and one of the garlic halves. Secure half of a lemon in place with the pul side IN to steam the chicken with the herbs and lemon from the inside as it cooks. Be sure to keep washing hands throughout as raw chicken is dangerous. Rub olive oil over the top and exterior of the bird. Dust liberally with the salt. Crack a few turns of pepper over the chicken next. Next take all fresh herbs and rub onto the chicken. Then I dust the dried herbs on top of THOSE fresh herbs. Position half cloves of garlic and lemon halves around the chicken. Carefully pour the 1 cup of Chardonnay into the well of the pot. Not only will the chicken roast in the heat but steam in the aromas of white wine, garlic and lemon! Cover with lid and Roast for 45-55 minutes. Remove chicken from the oven after the initial 45-55 minutes of roasting. Place the olive oil covered vegetables around the perimeter of the chicken. I drizzle the left over olive oil over the top of the chicken. Place lid back on the dutch oven and slide back into the oven for 45-50 minutes more, depending on how large your chicken is. 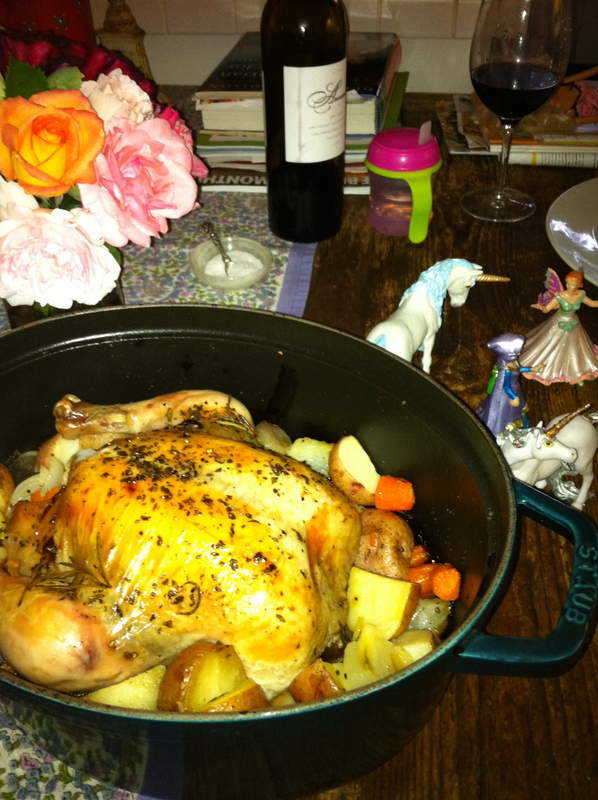 ** If you have more vegetables than your pot allows, roast them below in a cute pan. Remove from oven and uncover. If it’s not golden brown yet, crank heat up and toast the top of the Chicken a few minutes more. 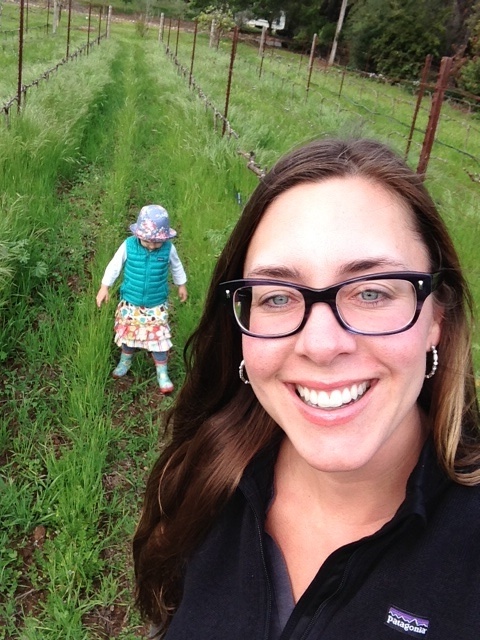 Let stand 10-12 minutes and serve with Annadel 2012 Chardonnay or 2009 Anni’s Blend!! Drizzle chicken with hot lemon juices. And watch people fight over the scrapings of bread and roasted garlics from the bottom of the pot!